1 Have you ever seen a dam? A dam is a huge wall that is built across a river. The dam holds water and prevents it from flowing downstream. On one side of a dam is a huge lake, a reservoir. On the other side is a narrow river. The river flows from the bottom of the dam. The surface of the lake sits hundreds of feet above, near the top of the dam. 2 Why would anyone want to build a dam? It takes a lot of time, a lot of materials, and a lot of money to build one. When a dam is made, a river is blocked off. It makes the water level rise up on one side of the dam. A lot of land is flooded in the process. Why would anyone want to do this? The answer is electricity. Dams can be used to make electricity. 3 There are many ways to make electricity. One way is by burning coal. Coal is a cheap way to make electricity, but it has its problems. Burning coal makes smoke that pollutes the air. The process also heats up a lot of water. This can be bad for the fish that live in the lakes and rivers near coal power plants. Another bad thing about burning coal is that it is a nonrenewable resource. The coal is used up. Coal is dug up out of the ground, but some day, we will run out of it. 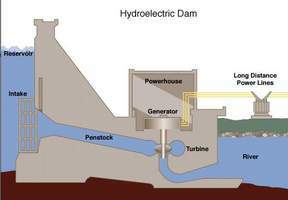 Feedback on How Do Hydroelectric Dams Work?